What’s the use of the Rolex 24 Hour Hand? 1954 followed perhaps one of Rolex’s biggest year after introducing the Submariner and with Sir Edmund Hillary and Tenzig Norgay being the first two humans to scale Mount Everest. Despite being a hard year to follow, Rolex introduced yet another innovation by rolling out the Rolex GMT. What set the Rolex GMT apart for any other watch was the addition of the 24 hour hand and the ability to track a second time zone. Early in the 1950’s, Pan American Airlines approached Rolex to design a watch that could track 24 hour Greenwich Mean Time. Greenwich Mean Time, then known as GMT and now known as Universal Time Coordinated (UTC), is the international time standard no matter what timezone a person is in. GMT time does not recognize timezones and the time is universal around the globe. GMT time started in the 1800’s for ships to navigate. Based on the Turn-O-Graph, the first Rolex GMT did not have crown guards, but it possessed a rotating bezel with 24 hour markers. The 24 hour hand was connected to the 12 hour hand, but only traveled half as fast as the 12 hour hand. Subsequently, a 24 hour hand only makes a full rotation for every two rotations of the 12 hour hand. Utilizing the sliding 24 hour bezel, airline pilots, international travelers, or international business people can track time in another timezone. 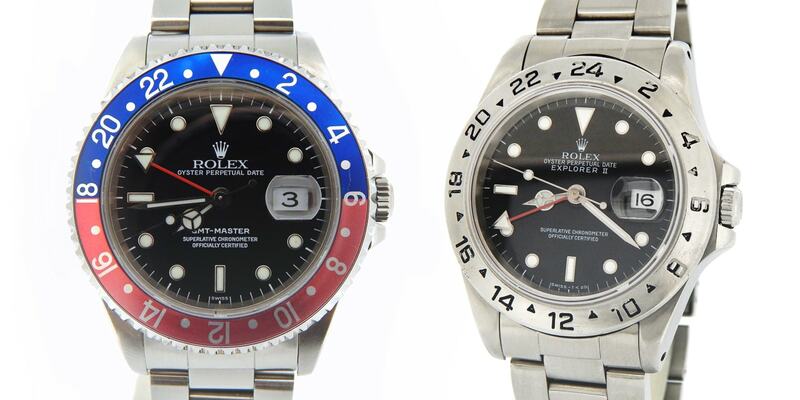 Later in the 1982, Rolex introduced the GMT Master II which made the 12 hour hand independent of the 24 hour hand, allowing the tracking of a third time zone, and made it easy to change the 12 hour hand when moving among timezones on an airplane, or for a select few, a spacecraft. Rolex released the Explorer II in 1971, a mix between the original Explorer three handed model, and the GMT four handed model. The Explorer II was designed for underground spelunkers and adventurers. Although the Explorer II uses the same movement as the GMT, what makes it significantly different is bezel. The Explorer II bezel is fixed whereby the hour indicators could be felt by hand, and the 24 hour hand designates local time but in day or night. Aside from distinguishing AM/PM, and 24 hour time, the 24 hour hand also serves as an indicator for North. If the 24 hour hand is set to local time, pointing the 12 hour hand to the sun will make the 24 hour hand point North. In the Southern Hemisphere, the same is true, but you have to hold the watch overhead for this to work. The 24 hour hand is found on multiple watches, but it took Pan Am’s request and Rolex’s inventiveness to make it happen.